8. Where to start - 8-ball, Part I. 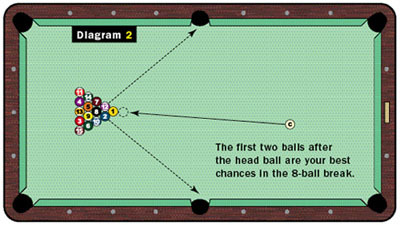 In 8-ball, it's crucial to make a solid hit with the energy of the stroke directed straight into the head ball and rack, so many pros break within the first diamond from center (left or right). 9. Where to start - 8-ball, Part II. 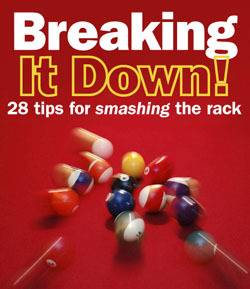 Billiards Digest 8-ball guru Larry Schwartz recommends using another break if the rules say you win by sinking the 8 on the break. (Some rules call for spotting the 8.) In this circumstance (Diagram 3), hit the second ball as fully as possible, either from the right or left. Strike the cue ball with low right English if you are breaking from the left, and use low left if you are breaking from the right. The English helps to keep you from scratching. This break helps propel the 8 from the pack toward the pockets, and you get a good spread no matter what. Plus, there's a secondary break when the cue ball comes off the rails. 10. Object ball paths - 8-ball. 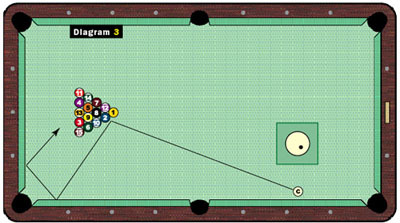 Obviously, the 8-ball break is exponentially more complex than the 9-ball break, so it's difficult to control any of the object balls with any precision. But we do know that your best friends are the two balls after the head ball, which tend to meander toward their respective side pockets (see Diagram 2). 12. Bridge arm. It should be relaxed and bent at a slight angle. If it's straight and stiff, it will inhibit your body on the backswing and keep your body from moving into the shot. 13. Bridge distance from cue ball. A lot of pros set up a bit farther away than normal on the break shot - maybe 8 or 10 inches (see photos below). "You have to take it back farther on the backswing, and you follow-through so much that you need to make more room,' says Johnny Archer. The extra distance certainly allows for more acceleration on your stroke. (If you're bridging from the rail, the distance will tend to be shorter.) But be careful: the longer the bridge distance, the less accurate your stroke will tend to be. 14. Back hand position. There's a lot of debate over whether you should reach a few inches farther back on the cue for your break shot - giving you a longer stroke - or to keep your back hand in its usual position. Experiment, and go with what's comfortable. 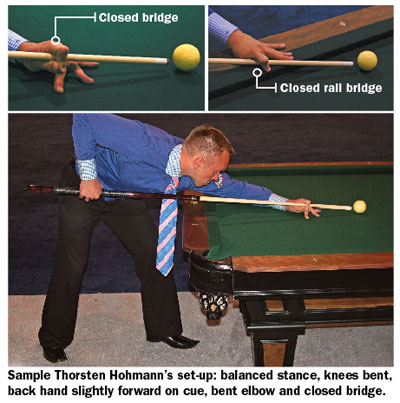 For the record, Thorsten Hohmann actually chokes up a few inches for the break for more control (see photo below). Jeanette Lee also chokes up, as does hot new Filipino Jeff De Luna.